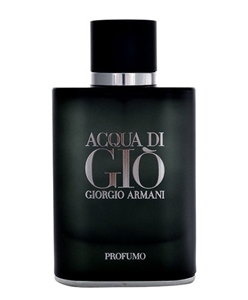 Acqua Di Gio Profumo is an intensely masculine fragrance. The elixir opens in a single wave of spices and citrus notes of elemi and bergamot. The heart erupts with geranium, sage, and rosemary, pulsing as it warms the skin to release a recognizable cloud of patchouli and incense.